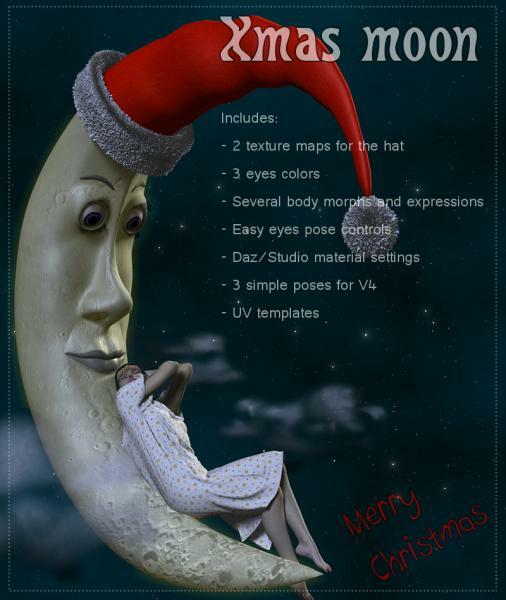 Xmas moon is a Poser/Daz Studio original toon character, created for Faeriewylde Solstice Celebrations 2011. Simidae (4 years ago) Inappropriate? I just used this, sending you a link. So cool. :) Thank you! Anthonia (7 years ago) Inappropriate? adrie (7 years ago) Inappropriate? Looks such a cool product....thank you. dbeez13 (7 years ago) Inappropriate? Allegra (7 years ago) Inappropriate? He's terrific! Thank you, Marco. Very nice looking "fairytale" moon, thanks a lot! Don't ask me what, yet, but I'm gonna' figure out some use for this. It looks too good!